The Next Generation: Farm Safety and Health | Devoted to the future of agriculture by protecting the next generation of farmers and ranchers. Q: How fast might you be moving when riding an ATV? How does speed influence the impact of being thrown from a vehicle? A: Depending on the size of an ATV, it can travel at road speeds (40 to 80 miles per hour). Most of the time ATVs travel at much slower speeds because they are moving up or down hills, over bumps, and around curves. Due to momentum, the faster a vehicle is moving the further an obstacle or person is thrown from the vehicle. The force of hitting a stationary object (road surface, tree, another vehicle, etc.) is directly proportional to speed. Q: What other personal protective equipment (PPE) is needed when operating an ATV? A: Although a helmet is the most important PPE, ATV operators should also wear long sleeved shirts, long pants, over-the-ankle boots, gloves, and goggles. Each PPE protects a different part of the body, with the brain being the most fragile. Q: Are all helmets made the same? A: There are different types of helmets for different forms of transportation. Examples include: equestrian, bicycle, and motorcycle helmets. Each one has its own requirements based on speed and size of the transportation mode. Q: What’s the purpose of the face shield on an ATV helmet? A: Like the brain, your face contains very important items such as eyes, nose, and mouth. If thrown from an ATV, your head and face are often the first items to impact. The face guard provides additional protection to these crucial areas of the head. Q: How do you determine the right sized ATV helmet? A: ATV helmets should fit snugly and be stable when you shake your head from side-to-side or front-to-back. Try on several at the store. There is much padding within the helmet for protection purposes and there should be some resistance when pulling it over your head. Bigger is not necessarily better. A loose fitting helmet can be dangerous, fly off the head, and be noisy due to increased wind resistance. Have any other questions for us? Let us know in a comment below! 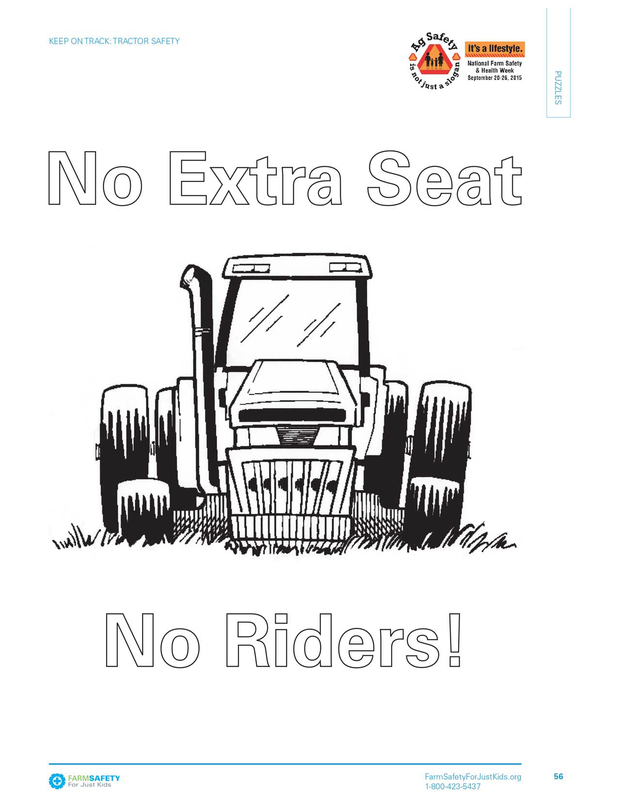 Tractor Safety is an important topic. Day 5 of Farm Safety and Health week is focused on tractors and educating the public of the dangers and risks. 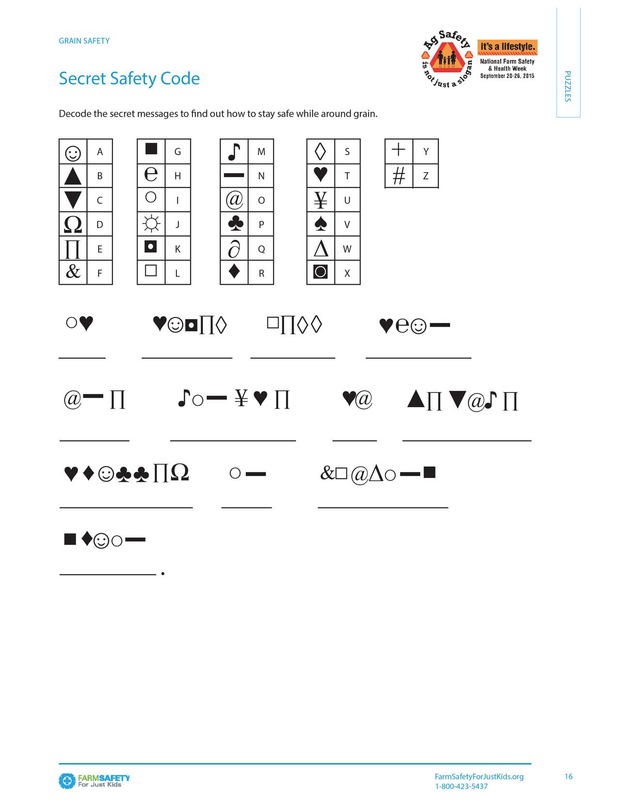 Download the PDF below and to help start a conversation between you and your kids. Follow the chatter and see what you missed by following #FSHW15 on social media. Each year, hundreds of these children die and thousands are injured on the farm where they live, work and play. 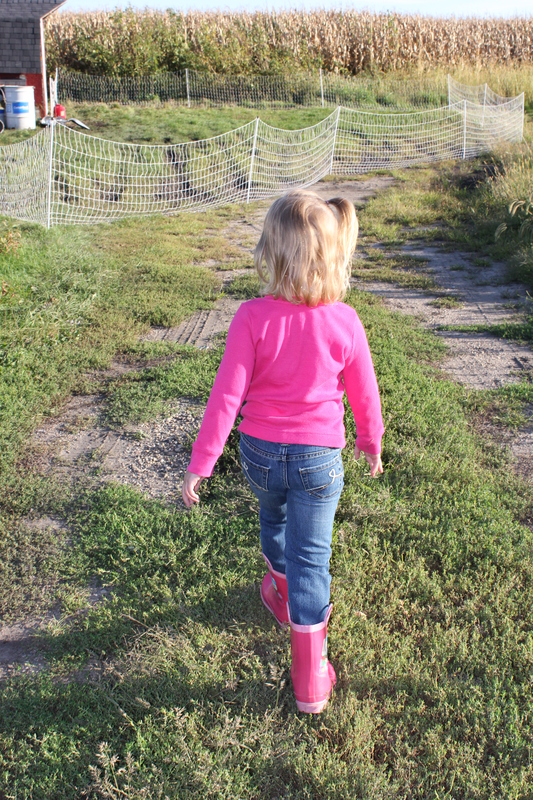 Children are vulnerable to many of the same hazards as adults who live or work on farms, but they are less capable of understanding those hazards. Although parents cannot completely child-proof a farm or ranch, they need to make it as safe as possible. Farm-related childhood injuries and deaths may seem unpredictable and random, but there are definite factors that should play a part in prevention efforts. Farm Safety & Health Week is finally here! Hooray! Today’s focus is on rural roadway safety, an important topic considering fall harvest is just around the corner. 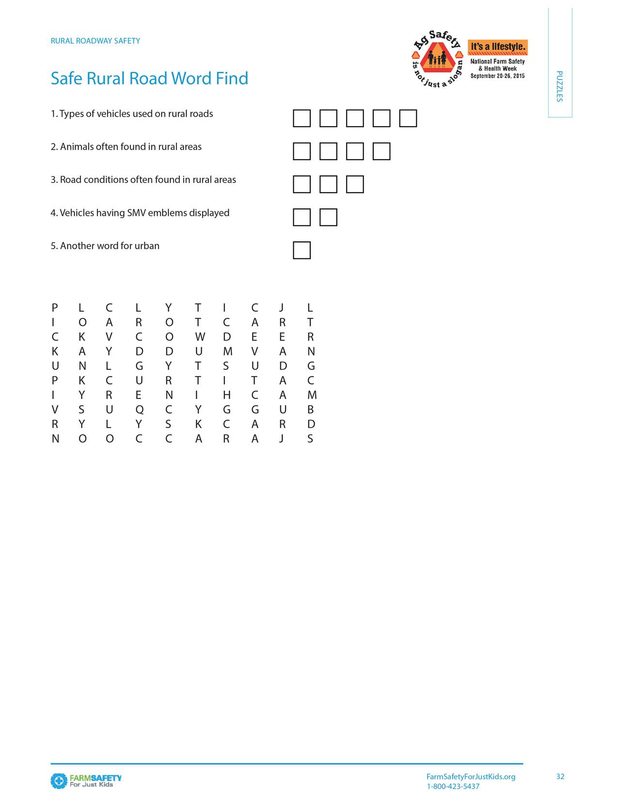 Download the PDF below to teach your kids about the dangers of rural roads. Follow the conversations this week by following #FSHW15 on social media. Most ATVs are built for one operator. ATV seats are large, but that’s to allow the driver room to move when turning corners or maneuvering terrain. It’s not designed for additional people to ride. 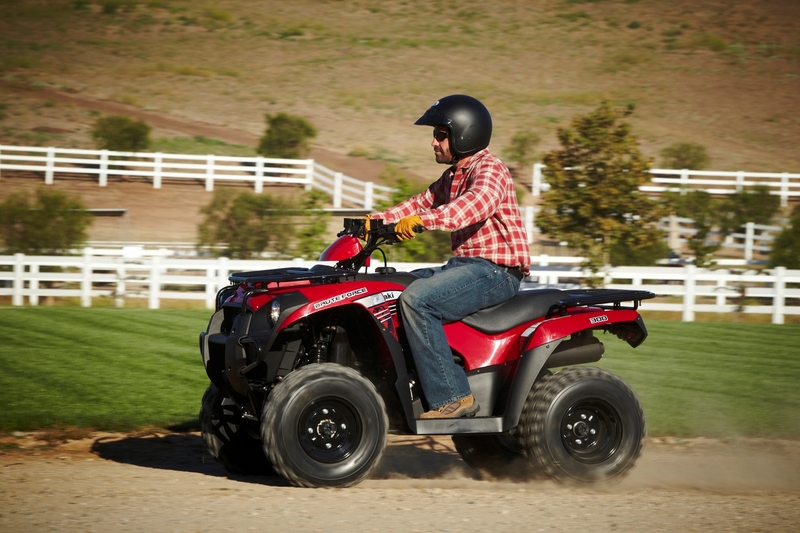 An additional person’s weight alters the ATV’s center of gravity. The center of gravity is the point where the machine is most stable. The lower and more centered the center of gravity the more stable the machine and less likely to tip over. When a person rides on the machine with the operator the center of gravity moves in the direction of the extra weight. This means the vehicle is more likely to tip over. This can also be true if you are hauling heavy items. Chemicals, hay, or feed being hauled alter the center of gravity similar to the weight of an extra rider. When another person is riding on an ATV they distract the operator away from his/her main responsibility – driving safely. Operating an ATV takes lots of body movement. When there’s another person in close proximity, it’s more difficult for the operator to move appropriately. 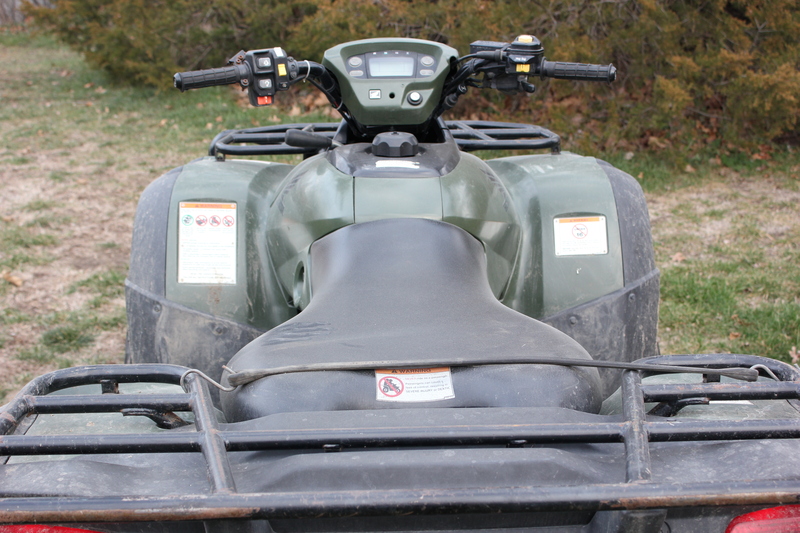 Some ATVs are built for additional riders. If this is the case, the user’s manual will say so. The manufacturer took the extra weight into consideration when designing the ATV.